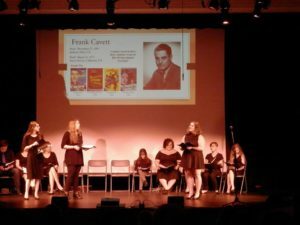 The Markay Theatre is home to live music, comedy, and theatrical productions since it’s grand re-opening in August of 2015. The 280-seat theatre can also be rented for business and corporate events, complete with a state-of-the-art sound system, lighting, and projector. Four original octagonal chandeliers with 64 panes of acid-etched glass and sand blasted floral/ribbon patterning have been painstakingly restored and now sparkle beneath the acoustical clouds. They provide a finishing touch to the theatre. 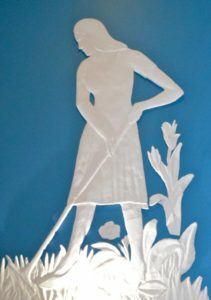 Bas-relief is a technique that retains the natural contours of the figures, and allows the work to be viewed from many angles without distortion of the figures themselves. Six figures on view in the restored Markay Theatre can be seen in this image. 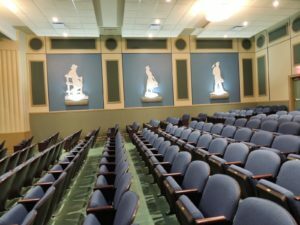 Restoring the six larger-than-life bas-relief figures on the theatre’s walls that depict life in Jackson County in 1940 was one of our greatest coups. They were created by an artist named Frank Boerder, of Indianapolis, when the Markay was purchased by the Chakeres chain of movie houses. Not only do they pinpoint Jackson’s industrial past, but they are WPA-era works, a short but distinct period. In addition, these impressive figures loomed large on the walls, starkly lit in the darkened auditorium. Attention was riveted on them. People now in their older years have fond memories of that “first kiss” happening right under these bas-reliefs. It was critical for artistic, historic, and personal reasons to restore these figures to their original glory.